The Linksys RE6350 AC1200 Wi-Fi Range Extender is a dual-band wireless range extender that helps boost your Wi-Fi® range up to 7500 sq. ft. for better coverage and signal strength. Wi-Fi Protected Setup™ (WPS) button – Use the WPS button to automatically and securely add wireless devices to your network. Reset button – Press and hold the reset button for 10 seconds or until the light indicator starts to blink to restore to factory defaults. Fix: Unplug the range extender and move it closer to the router. If the router is in order, unplug the range extender, move it closer to the router. Then, plug it back in. Wait for one minute and reconnect to your network. 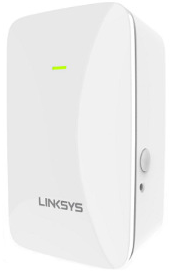 To know more about the Linksys RE6350, click here.